Every time you install any programs on your windows operating system, the installed program will create a folder to store files and add some registry entry. If you use default windows uninstaller tool to uninstall program, then you might know that it won’t remove all the folder and files that installed program has created. It just removes only few files. After uninstalling any program, I think we don’t need to keep any folder or files on our system. We can remove those folder manually by going to the installation location, but this is really not a good option if you try lot of new software on your system. Removing registry entry of that software manually is really tedious process. Moreover, most of the users don’t know how to user registry editors to remove registry entries manually. So for that reason many users use uninstaller tool to do this task. Geek uninstaller is a light weight uninstaller utility tool for windows users. This tool performs uninstall function, removes left over folders of the uninstalled software and removers registry entry of that program. What I like about this software is, you don’t need to install this software to start using this. That means, you can download Standalone version to avoid installation. Moreover, this tool is pretty fast to open when we compared to windows uninstaller option. A Simple and fast way to manage our installed programs. To uninstall any software-just double click on that program, and it will open uninstallation wizard. 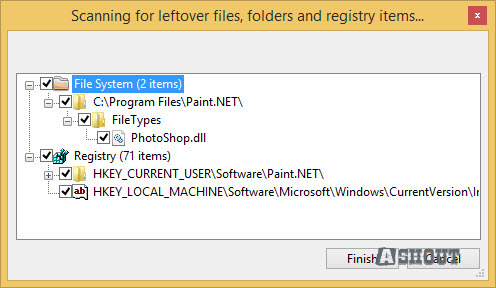 After completing uninstallation this tool will scan for leftover files, folders and registry items for that program. To remove those traced files click on Finish button. You can sort installed programs based on the program name, size, installation date. If you wish search any installed program on this tool, then use search feature which appears at the bottom of this tool. 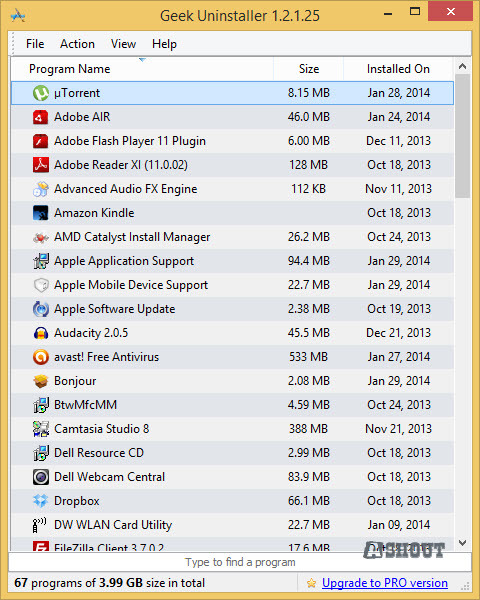 This tool also displays the total space occupied by all programs because of installation. The Export feature (File >> Export to Html..) allows user to export installed programs list on your PC to an html file. This feature will be useful if you need to send or list all your installed programs. To get more info about your installed programs, just select any program and right click and choose any option that you wish see. Uninstall: To uninstall the selected program. 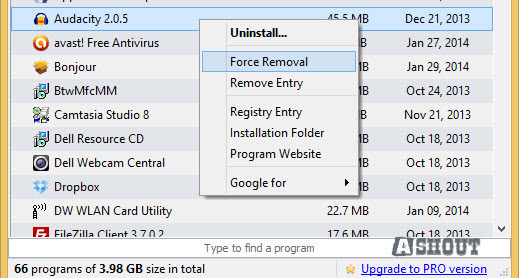 Force Removal: This option allows you to remove programs which is not completely uninstalled or having problem with uninstallation because of missing files. Remove Entry: Sometime we don’t want to show our installed program name in installed program list, that time you can use this option to remove only the program name while keeping software on your PC. Registry Entry: Opens the registry editor containing entry of that software. Installation Folder: Opens the installation folder of that software. Program Website: Visit the software website that you have selected. Google for: Googles for the program name. These are all the options which comes with Geek uninstaller. If you are looking for small, portable, fast and complete uninstall utility program, then you try this software. If you don’t use install and uninstall options a lot, then I think you don’t need such extra tools manage your installed programs. Anyway, this is really a good tool to remove programs completely form your PC.